Can someone point out why these directed graphs aren't equivalence relations? 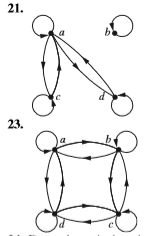 As far as I can tell, these two directed graphs are reflexive, symmetric and transitive. In the first one we have c ~ a and a ~ d but not c ~ d, so the relation is not transitive. A similar problem exists for the other graph. See if you can find the issue yourself. Then ask yourself what the graph of an equivalence relation looks like in general. Not the answer you're looking for? Browse other questions tagged graphs discrete-mathematics transitivity or ask your own question. How to construct this generalized xor without needing an extra vector? $\lambda$-terms equal modulo $\alpha$-renaming, is this an equivalence relation? Reflexive transitive closure = (zero or more) Kleene star?